Convenient onsite parking is available at the museum. Parking is free for the first 30 minutes. Parking for visitors with disabilities is provided on level P1. The Petersen has 3 EV charging ports for electric vehicles located on the south side of P1. The parking garage entrance is located on Fairfax Avenue. Metro provides bus and rail transportation to the Petersen until 2AM on Fridays and Saturdays. For your best route, click HERE or call (323) GO-METRO or (323) 466-3876. 1963 Chevrolet Impala "El Rey"
1964 Chevrolet Impala "Gypsy Rose"
1966 Chrysler Imperial "Black Beauty"
1966 Ford Thunderbird "Thelma and Louise"
1967 Long "Shelby Super Snake"
1967 Toyota 2000GT Roadster "You Only Live Twice"
Rated by CNN, Octane, and Top Gear as “the world’s greatest automotive museum” the Petersen Automotive Museum has always been an amazing setting for glamorous celebrations. But, after its 2015 total transformation inside and out, with four floors of venue space, it’s become a positively astounding place for your next event. The quintessential Sicilian family name widely credited for bringing authentic Italian cuisine to Los Angeles is proudly debuting their newest venture, Drago Ristorante in the Petersen Automotive Museum. A collaboration between brothers Celestino, Calogero, Tanino and Giacomino Drago, the entire famiglia is has come together to offer locals and visitors alike a taste of housemade pastas, wood-fired pizzas, an innovative assortment of entrees, artisanal breads and pastries from Drago’s Dolce Forno bakery in Culver City and locally grown produce from Drago Farms in Santa Ynez. 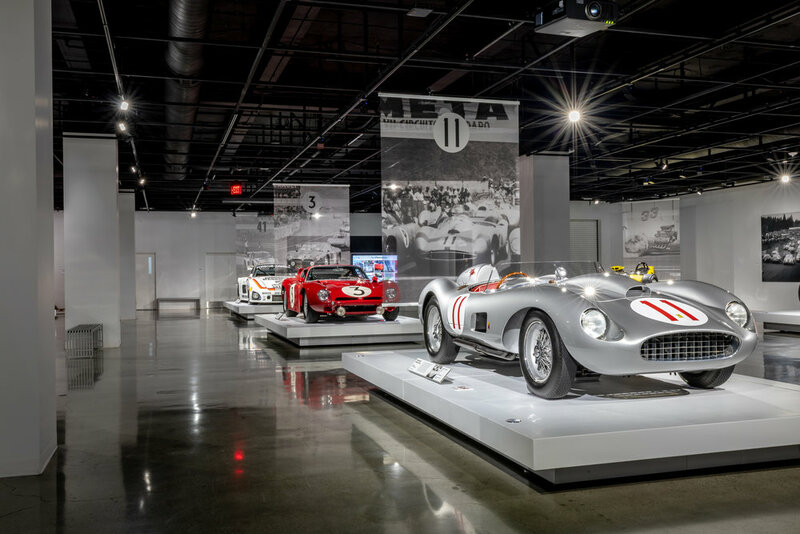 The Petersen recognizes the diversity of our visitors’ abilities, needs and learning preferences, and we strive to ensure the accessibility of the museum and its collections. For questions about accessibility or to arrange an accommodation, please contact education@petersen.org or 323-964-6317. Guests may be dropped off at the entrance on the first floor. Accessible parking spots (19) are only located on the first floor of the Petersen parking garage (P1), close to the main entrance. There are no accessible parking spaces on the second, third, or fourth levels. The second, third, and fourth levels of the parking garage are not serviced by elevators.